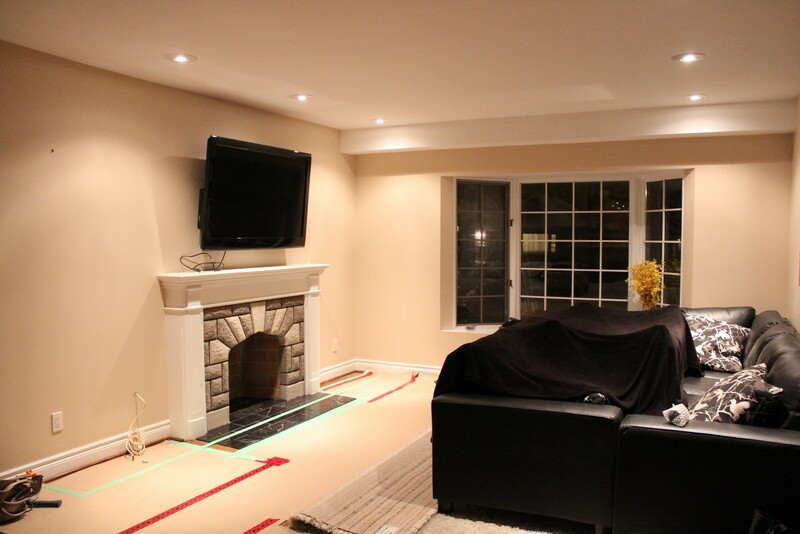 Marble Fireplace Mantle & Custom Built-ins – Luxxwood Builders Ltd.
Our client had a fireplace in their living room that they were not happy with because of its messy appearance (mostly due to media wires & components) as well as lack of functional storage space. 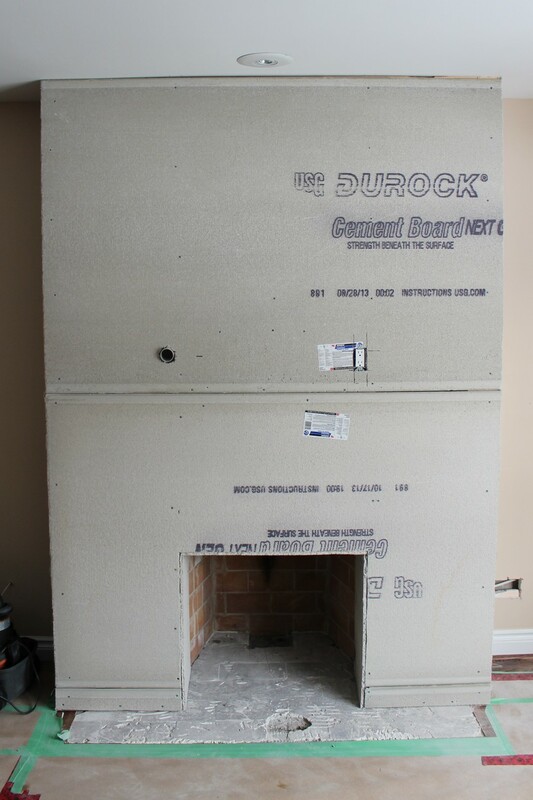 1) Must be functional – The wood-burning fireplace must still be operative. 2) Design – Clean and modern look. Light aesthetic as to not appear too overwhelming in the open concept family/dining room. All wiring to be hidden. Storage capabilities – Desired shelving for mementos as well as concealed storage for media components and other goods. We helped design a floor to ceiling mantle for the client, with plans in place for media wires to be run behind, straight into a cabinet on one side. 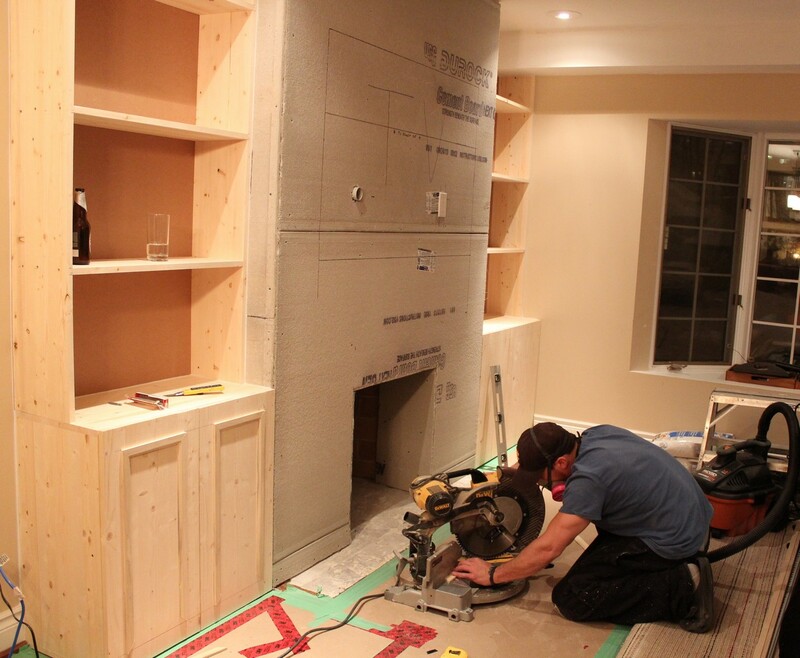 Built-in shelves and cabinets will satisfy all the client’s requirements. 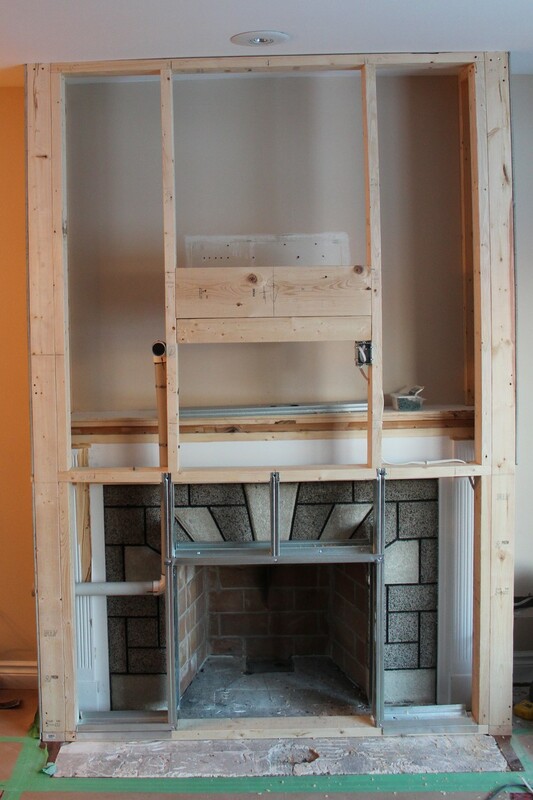 First steps included building a new frame for the fireplace mantle, as well as covering this frame with fire-resistant cement board. The customer had specific space requirements, both in terms of widths for respective sides and depth of shelves. The cabinets needed to be deep enough to house the relevant media equipment, but we suggested the depth of the shelves be reduced, in order to minimize the imposing feel of the structure in the room. Now is the exciting part – you get to see the vision truly start to appear in reality! 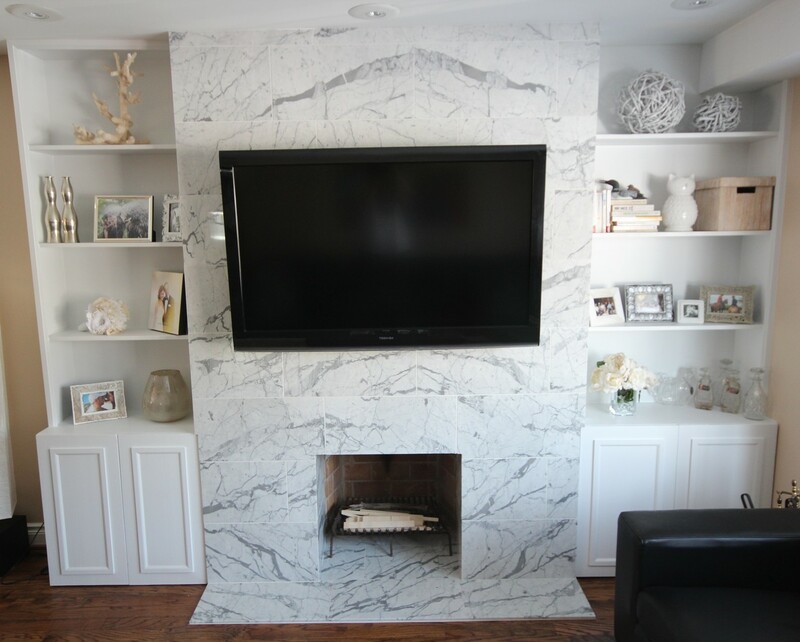 We used several thin coasts of CIL Smart3 Furniture and Cabinet Melamine on the built-ins and chose a gorgeous Carrara Marble tile for the face of the mantle. 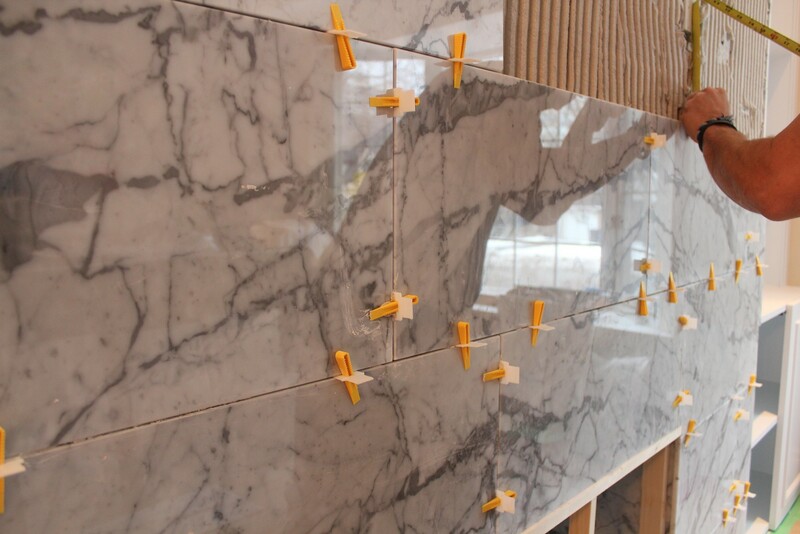 We wanted the mantle to give the feel of a slab of marble, so we set tile spaces at 1/16”. We would also note that while we in no way get any compensation for mentioning specific products on this blog, Lash Tile Leveling Clips are one of the best inventions we have encountered in this business. 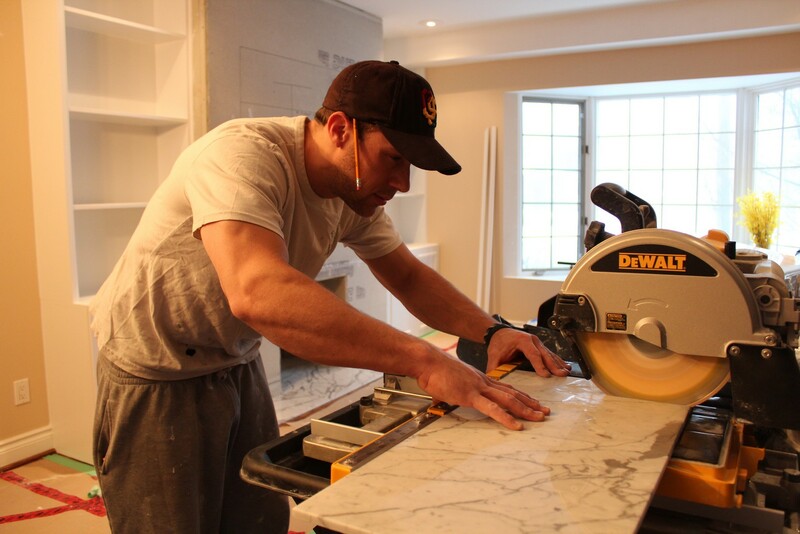 They are a little bit pricey, but make tiling effortless and ensure a beautifully smooth and flat surface. This is especially useful when you are working on a vertical surface. Once the TV is mounted and some personal items are added to the shelves, the effect is breathtaking. All in less than 5 days work!